The unit will allow U-M to better care for patients facing tremendous emotional and behavioral challenges. As Jo Elyn Nyman snipped the ceremonial maize and blue ribbon for the new inpatient psychiatry unit at C. S. Mott Children’s Hospital, she saw an unrelenting passion and long-held vision realized. The 16-bed unit on Mott’s eighth floor offers state-of-the-art resources and treatment spaces for children and adolescents suffering from psychiatric illness. Nyman, a psychotherapist in Birmingham, Michigan, partnered with the U-M Health System to design the unit as a safe and therapeutic environment where patients can recover, heal and thrive. 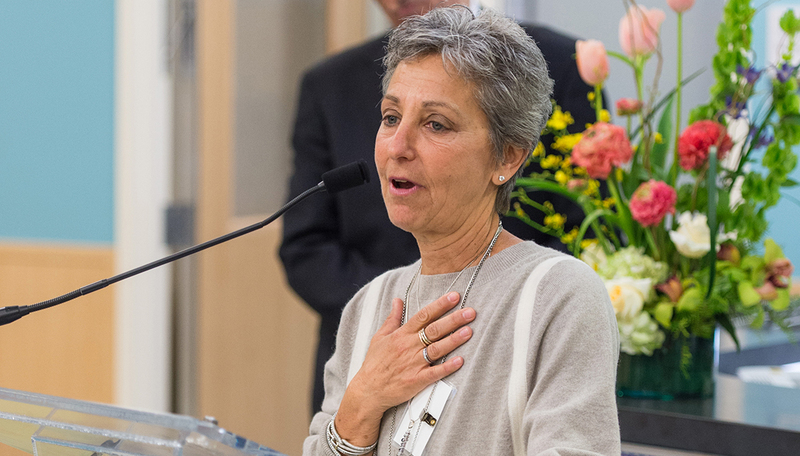 Thanks to her expertise, and her generous gift through the Samuel and Jean Frankel Health and Research Foundation, the Nyman Family Unit for Child and Adolescent Mental Health and Wellness will allow U-M to better care for patients facing tremendous emotional and behavioral challenges. Until recently, the pediatric inpatient psychiatry unit was located in the former Mott hospital facility, now University Hospital South. The new unit’s close proximity to Mott’s full cohort of pediatric medical staff will allow more medically acute patients — those recovering from self-injury or a serious eating disorder, for example — to receive seamless, coordinated treatment. Patients admitted medically and recommended to be transferred to an inpatient unit won’t have to move far, which immediately feels less stigmatizing than being taken to an entirely different area of the hospital, says Bernard “Ben” Biermann, M.D., Ph.D., child and adolescent psychiatry inpatient director and clinical assistant professor of psychiatry. The unit was designed, in part, to let kids be kids, with features like the Everbright wall, a jumbo, interactive LED light box, and the large day room. In the Nyman Family Unit, patients and their families are surrounded by modern, sunlit waiting areas and consultation rooms, expansive views of Nichols Arboretum, and cheerful paintings and patient artwork, including ceramic tiles that embellish the nurse’s station. The unit was designed, in part, to let kids be kids, with features like the Everbright wall, a jumbo, interactive LED light box; the large day room, gym and classrooms; and a full program of activities. The dining room displays inspirational quotes written by patients: If nothing ever changed, there would be no butterflies; Dream. Believe. Do. Repeat. And a smaller, more private subunit offers quieter areas for patients who benefit from less stimulation during their treatment. “This unit represents a very deep commitment to creating a place that really, truly meets the needs of these children,” said Sheila Marcus (M.D. 1983, Residency 1988, Fellowship 1991), clinical professor and director of the Child and Adolescent Psychiatry Section, service chief of child and adolescent psychiatry, and a research professor at the Center for Human Growth and Development, during her remarks. At the ribbon cutting, Gregory Dalack, M.D., associate professor and chair of psychiatry, recognized and thanked everyone involved in bringing Nyman’s vision to fruition. The Joseph and Karen Krantz Family Charitable Foundation donated the Everbright wall, and others who contributed to the unit include: Kathy and Toby Brzoznowski; Alan and Swanna Saltiel; Herb and Andrea Ouida and the Todd Ouida Children’s Foundation; and Steven and Karen Sanger.